Coding with newly defined (free) codes: As in Grounded Theory, a segment can be assigned a new (free) code. In-Vivo coding: In-Vivo coding: Select and highlight meaningful terms in the texts and automatically add them as codes in your code system while coding the text segment with the code. Coding with selected codes from the Quick List: Documents are targeted based on the occurrence of one or more pre-selected codes, and coded where applicable. Simultaneous coding with multiple codes: A segment is coded with the activated codes. Coding with code favorites: Selected codes are displayed in a separate window, from which they can be easily applied to segments to be coded. Coding with self-defined keyboard shortcuts: Up to nine codes can be assigned their own keyboard shortcut, which can be used to quickly code a marked-segment. Coding with MAXMaps: Marked segments are dragged onto selected codes, which are arranged on a “map” or diagram. Highlight coding: This works like highlighting a text passage in a book with a colored text marker. In MAXQDA, five different colors can be used for color coding: red, green, yellow, blue or magenta. Coding with symbols and emoticons: Selected segments are coded with emoticodes, i.e. an emoticon or a symbol. Coding in the “Retrieved Segments” window and “Overview of Coded Segments”: Coded text passages can be compiled in a list. In these compiled segments you can then select and code further text passages. For more information, see the section Coding in the “Retrieved Segments” window and the “Overview of Coded Segments”. The following section describes in detail how these techniques are used. The different options can be chosen from the context menu that pops up when you select a document segment and click the right mouse button. An easy way to create a new code, i.e. a code that is not yet listed in the “Code System,” is to use the shortcut Ctrl+W (Windows) or cmd+option+W (Mac). Alternatively, click on the selected segment with the right mouse button and choose With new code or click the Code retrieved segments with a new code icon in the “Document Browser” toolbar. A dialog window will open, and you can type in the name of the new code. The code will be added to the “Code System” at the highest level of the hierarchy. If necessary, you can later move the code to another level in the “Code System” with your mouse. Another way of coding is with the so-called in-vivo coding. If you, for example, select the word “global village” and then click on the Code in-vivo symbol in the toolbar on the “Document Browser”, the word “global village” is added to the “Code System” as the code for this short text segment. The shortcut Ctrl+I (Windows) or cmd+option+I (Mac) has the same effect. When you want to code a whole segment of text with the in-vivo coding function, and not only one or two words, code the one or two words with this function first. Next, select the entire text segment (including the word) and click Code highlighted segment symbol (not the in-vivo coding button!). MAXQDA expands the coded segment automatically. The “Code” toolbar provides quick access to frequently used coding functions. The “Quick List” is located on the toolbar to the right of the Edit button. Whenever you click on a code in the Code System, or when coding is in progress, the corresponding code appears at the top of the Quick List. Click on the Code highlighted segment immediately to the right of the Quick List to assign the code in the window to the selected segment. In this way, multiple areas of a document can be coded without having to select the code each time. You can also use the keyboard shortcut Ctrl+L (Windows) or cmd+option+L (Mac) – this way you code with the last code you used. First, activate the codes in the “Code System” that you want to use to code the selected segment in the “Document Browser.” To activate a code, you can right-click the “Code System” and select Activate. Then right-click on the segment and choose the option Code with activated codes. If you are working with an extensive “Code System,” it can be difficult to work efficiently, since it is hard to find each code quickly in the large list. The coding Quick List offers on way of working around this, but there is another option that can be helpful in certain circumstances. It allows you to also code with more than one code at once. The function is called the code favorites. And how does it work? Simply right-click on a code and select Add code to code favorites. After you have added the first code, the code favorites window will appear. You can then continue to add more codes to the list in the same fashion: right-click on the code and select Add code to code favorites. Tip: You can also drag and drop codes from the “Code System” into the open “Code favorites” window. You can now begin to code. Simply highlight the segment as usual and click on the code in your list of Code favorites. You can now see in the coding column on the left side of the “Document Browser” that the segments have been coded. Tip: You can also drag and drop a highlighted segment on a code in the code favorites window or vice versa drag and drop a code onto a highlighted segment. When you are finished using the code favorite window, simply close it by clicking on the x in the top-right corner. To re-open the window, you can either add another code (via the context menu) or select Code favorites from the Codes drop-down menu. If you want to rearrange the sequence of the codes, click on the icon Edit code favorites. Now, highlight codes with the mouse and use the arrow up and down icons to move codes up and down. 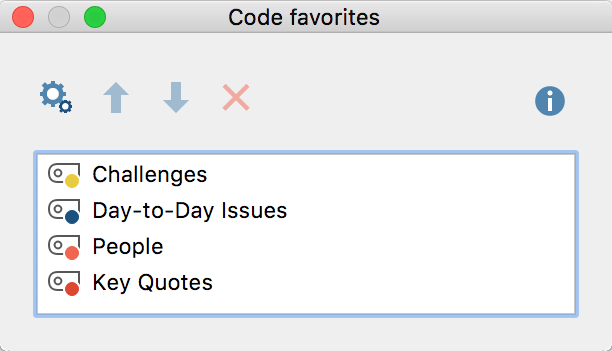 To delete a highlighted code, click on the red X labeled Remove selected codes from code favorites at the top of the window. Click again on the Edit code favorites icon to continue with your coding work. If you drag a high-lighted segment onto a code in the code favorites window the Edit Mode will be switched off automatically. Tip: You can remove a code from the code favorites at any time by clicking the right mouse button in the window and selecting Remove selected codes from code favorites. You can also remove several codes by highlighting them first. In the left column you will see the available keyboard shortcuts Ctrl + 1 to Ctrl + 9 (Windows) or cmd + 1 to cmd + 9 (Mac). You can drag and drop a code from the list of codes into one of the nine rows, thus assigning a keyboard shortcut to the code. If a shortcut already been assigned, it will be overwritten by this action. For clarity, the name of the code appears in the right column, along with the parent code if necessary – not the entire code hierarchy. To cancel the assignment of a shortcut to a code, click on the appropriate row and click the Remove Shortcut button. For coding, it may be helpful to leave the keyboard shortcuts window open until you have memorized the shortcuts. It does not matter if the window is open or not when coding: Simply highlight a segment in the Document Browser and hit the selected shortcut keys. MAXQDA will then encode the selected segment with the associated code. 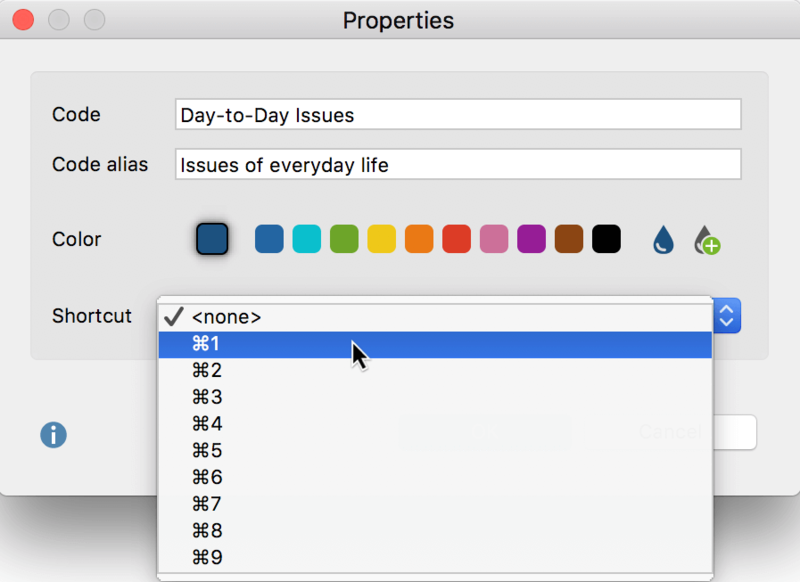 Tip: When you right-click on a code and select Properties, a window will open in which you can assign the code directly to one of the nine available keyboard shortcuts. If the shortcut is already in use for a different code, MAXQDA will ask if you want to reassign the shortcut to this code. The “Code System” is organized in a hierarchical tree structure, which does not allow for multiple cross-relationships between subcodes. In some cases, it may be necessary to create a non-hierarchical structure to form network relationships and organize codes in a different structure. This is possible with MAXMaps, the mapping tool that is part of MAXQDA. Open MAXMaps in the Visual Tools tab to start the tool and create a new map. Use Drag & Drop or Alt/option+double-click to copy codes from your code system to the map. Codes can be freely arranged on the map, linked to each other with arrows or lines, and free symbols or images can be added to the map. Coding is simple: Drag a selected segment from the “Document Browser” to a code in the map. « Display Coded Segments in the "Document Browser"